You've found the “U.S. Coopworth Sheep Breeders” page here at Hobby Farm Wisdom! If this is the first time you have visited our site: Welcome! 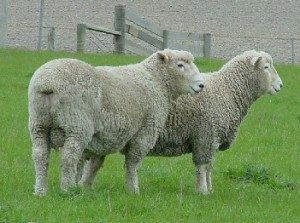 A dual-purpose breed, the Coopworth sheep are originally from New Zealand. They are have a medium sized build with and alert but quiet disposition. Their face is white and they have off-white or beige wool. It’s the most dominant breed in New Zealand since it is a highly productive breed. Their fleece has a well-defined crimp and luster which makes it popular for hand spinners. Ewes lamb easily and they produce large amounts of milk. Lambs grow very fast and multiple births are common. The breed is ideal for low-input, pasture based systems. Rams weigh between 175-275 lbs and ewes between 140-175 lbs.